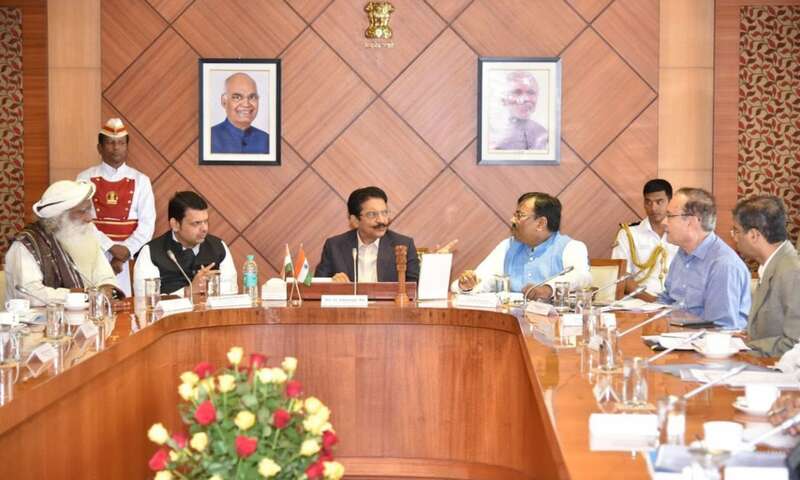 8 March 2019, Mumbai: The Maharashtra cabinet approved the pilot project for the revitalization of the Waghari River in Yavatmal on Tuesday 5th March. The Agriculture Department has earmarked Rs. 415 crore for project implementation. The cabinet approval also includes formation of a Special Purpose Vehicle for the project, which will have representation from members of Rally for Rivers and other technical experts. The government has subsequently released a Government Resolution which formalizes the project. Rally for Rivers, spearhead by Sadhguru, Founder of Isha Foundation, will work with the Government of Maharashtra towards the revitalization of the Waghari River in Yavatmal district. To revitalize Waghari and improve soil fertility and farmers’ economy, the project entails plantation on both sides of the river within the active mark of the floodplains. This will facilitate local farmers to shift from crop-based agriculture to tree-based farming to improve soil fertility, increasing horticulture fruit tree cultivation and medicinal tree-based agriculture in the region. Use of micro-irrigation methods, afforestation on government land through large-scale public participation and creation of infrastructure and support systems for farmers’ produce through public-private partnership, are a several other core aspects of the project. Sadhguru and the Rally for Rivers expert team made a detailed presentation to Chief Minister Devendra Fadnavis and Forest Minister Sudhir Munghantiwar on 8 August 2018 in Mumbai, following which a Detailed Project Report for the revitalization of Waghari was submitted in November 2018. The project will be carried out by the “Nadi Veeras”, the Rally for Rivers volunteers who joined project full time in early 2018 after Sadhguru made a clarion call to the youth of India to join hands to revitalize India’s severely depleted rivers.